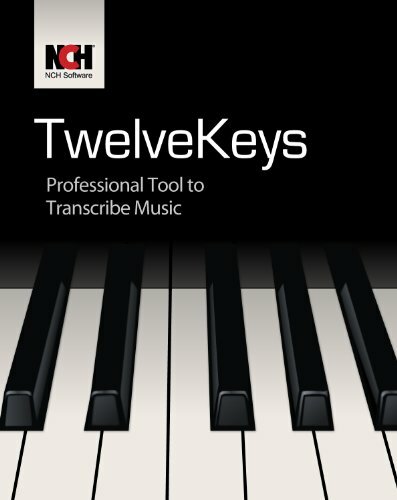 TwelveKeys is an aid to assist musicians in learning and transcribing music recordings. It is able to accurately detect notes in both simple single instrument recordings as well as complex polyphonic compositions, then show a visual representation of those notes. Analyses and graphs monotone and polyphonic audio recordings. Play your recording and watch the notes go past in real time. Configurable settings to get the clearest graphs possible. Rip files from CDs directly from TwelveKeys. Support for foot pedals to allow hands free operation. Slow down or speed up recordings without changing the pitch. Tone enabled piano keyboard to assist in identifying notes. Stereo channel separation. Ability to loop a section of the recording. Quick and easy operation. If you have any questions about this product by NCH Software, contact us by completing and submitting the form below. If you are looking for a specif part number, please include it with your message.